TECHNICAL SPECIFICATION DOCUMENT ADAPTIVE STABILIZER CONTROL DESCRIPTION: The stabilizer control is the brain behind the stabilizer system. Collecting vessel roll motion data and instantaneous performance feedback, the stabilizer control system combines the necessary parameters to quickly comprehend vessel roll motions and to then instigate an immediate response. The control logic is capable of accounting for and compensating to various operating conditions. The control is capable of collecting ship’s speed data via a NMEA 0183 interface to control maximum fin angle for high speed use. Adaptive logic tailors the ride making the ARC3000 perfect for underway stabilization. FEATURES:  DUAL-MODE OPERATION: The ARC3000 features an Automatic Mode, which accounts for vessel motions and adjusts the system response, without the need for continual manual adjustments. The control also offers full manual control for those situations in which manual input can result in improved performance. 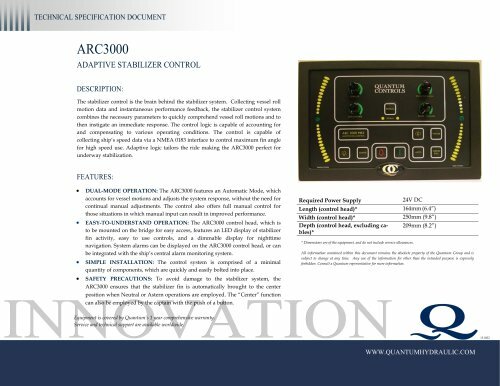  EASY-TO-UNDERSTAND OPERATION: The ARC3000 control head, which is to be mounted on the bridge for easy access, features an LED display of stabilizer fin activity, easy to use controls, and a dimmable display for nighttime navigation. System alarms can be displayed on the ARC3000 control head, or can be integrated with the ship’s central alarm monitoring system.  SIMPLE INSTALLATION: The control system is comprised of a minimal Required Power Supply Length (control head)* Width (control head)* Depth (control head, excluding cables)* * Dimensions are of the equipment, and do not include service allowances. All information contained within this document remains the absolute property of the Quantum Group and is subject to change at any time. Any use of the information for other than the intended purpose is expressly forbidden. Consult a Quantum representative for more information. quantity of components, which are quickly and easily bolted into place.  SAFETY PRECAUTIONS: To avoid damage to the stabilizer system, the ARC3000 ensures that the stabilizer fin is automatically brought to the center position when Neutral or Astern operations are employed. The “Center” function can also be employed by the captain with the push of a button. INNOVATION Equipment is covered by Quantum’s 1 year comprehensive warranty. Service and technical support are available worldwide.